Linda Steed found a deep and abiding love when she met her husband, Chris. They were married for 24 years before getting divorced, but they remained steadfast and devoted companions for 36 years. He survived a liver transplant in 1995. He survived a heart attack on October 14, 2016 and subsequent open heart surgery in November. But a massive heart attack on December 12 proved fatal. He died the next day, leaving Linda with many memories of their lives together. Linda said Chris was working at the Cone station on Murfreesboro Road when they first met. It was a full service gas station where customers would roll up next to the pump and tell the attendant to “Fill it up with regular.” As your tank was filled, the attendant would check your oil and clean your windshield. Such was life in La Vergne circa 1980. 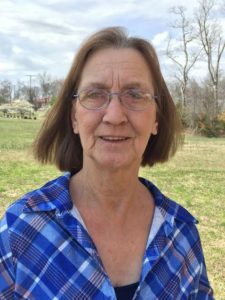 Linda has seen significant changes in the 37 years she has lived here, especially along Murfreesboro Road. She witnessed the construction of City Hall, Veterans Memorial Park, and the Post Office. Her husband worked at the city street department for years, which was located where the Senior Center is now. Linda lived in a house on Center Street for 29 years, across from John Waldron who is the father of La Vergne’s mayor. She remembered that every Halloween, Mr. Waldron would put a pumpkin on each porch in the neighborhood where a child lived. Linda said he and his wife often brought food to people they knew to be hungry. She said they were good neighbors. It was on Center Street that many of Linda’s fondest memories were made. When her daughter Stacey was about 18-months old, her 9-year old son Joe was told to watch his sister while Linda answered the phone. When she came back into the bathroom, her son had rolled up his pant legs, had his feet in the tub, and was bathing his baby sister. Joe didn’t always care so much for his sister. When Stacey was first born, Joe was at a neighbor’s house. When Linda went to get him to meet the baby, she said she had a surprise for him. He took one look at the brand new infant girl and said with great disappointment, “I thought it was a skateboard.” Joe went to his room, slammed the door, and didn’t come out for the rest of the afternoon. Linda said he finally did get that skateboard years later. Other happy memories Linda has of Chris were their visits to Seagrove Beach, where The Truman Show was filmed. Linda loves the area which is outside of Panama City, especially the different colored houses throughout the town. Today Linda, who has five grandchildren and three great-grandchildren, spends her days with her daughter and son. And she remembers her years with Chris with fondness and love. "We Are LaVergne: Linda Steed", 5 out of 5 based on 4 ratings.